In college, Garrett set school career records with 3862 rushing yards (averaging 7.4 yards-per-carry), 69 touchdowns, and 418 points scored. 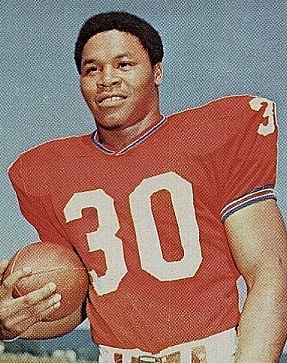 He received first-team NAIA All-American honors in 1966 and was a second-team choice in ’67. Garrett was chosen by the Patriots in the third round of the 1969 AFL/NFL draft and, with his great speed, had an immediate impact, rushing for 691 yards, catching 29 passes for another 267 yards, averaging 28.3 yards on 28 kickoff returns and 13.3 yards returning 12 punts, for a total of 1909 combined yards, second-best in the league. He was a second-team All-AFL selection by the NEA and was named to the AFL All-Star Game. Garrett missed time during training camp due to military service and then suffered through an injury-plagued season in 1970, rushing for only 272 yards and accumulating an all-purpose total of 1167. Patriots went 6-8 to finish third in the AFC East. Garrett had a lesser rushing year in 1972, although he achieved career highs with 30 pass receptions for 410 yards. Traded to the Chicago Bears in ’73, he led the club in rushing with 655 yards and also averaged a league-leading 30.4 yards on 16 kickoff returns. On the downside, he also fumbled 13 times. Following an injury-interrupted year in 1974 in which he appeared in just seven games, he moved on to the New York Jets in ’75, rushed for 566 yards, but had disciplinary issues and spent 1976 and ’77, his last two seasons, as a reserve with the Raiders. Overall, Garrett rushed for 4197 yards on 1031 attempts (4.1 avg. ), caught 182 passes for 1931 yards (10.6 avg. ), returned 154 kickoffs for a 24.1-yard average and 43 punts at an 11.3-yard clip, gaining 10,319 total yards and scoring 35 touchdowns. Of those totals, 2235 rushing yards, 1158 yards on 107 pass receptions, 92 punt returns for a 24.5 average, all of the punt returns, and 18 TDs came with the Patriots.